I promised to write up my birth story. It has been nearly four weeks, plenty of time for me to recuperate, rest and reflect. Every time I think on my last birth... I laugh. At first I thought that I needed to ponder more and come up with some deep knowledge or wisdom to share that I learned while entering that dark valley known as labor, being rent in twain and living to share about it. My birth was joyous and hilarious to me. While that may not be deep, I doubt many mothers find such joy in birth. So I will share it with you, and pray that others are likewise blessed with laughter both now and when you least expect it. My pregnancy went pretty easily. I did experience nausea from about week six to week fourteen. But overall I only puked a few times so I considered it 'mild'. My exhaustion was intense! But it also improved in my second trimester. I was even able to convince my children to let me nap sometimes. We had told the children immediately. We are always tooooooo excited to keep such news to ourselves. The older children were happy and eagerly offered names daily. The youngest, not unexpectedly, was confused and noticeably more clingy. I was not worried though. I knew that when the baby arrived, jealousy would have no place, shoved out by sheer wonder at what God creates in that hidden darkness. Our family would grow, our love would grow, our hearts would grow, again. pregnancies. I was unable to find a helpful midwife with my second pregnancy and was hesitant to go on that search again. But my husband, being more social (read that as, 'he talks and talks and talks like a woman....') was encouraged by some local cashier or something to contact our local midwife, with the promise that she was different. We met in her inviting home office, filled with newspaper clippings, announcement cards, and photos of some of her births. The wall was lined with books and videos on pregnancy and birth. Soothing (hippy) music was playing. She led us into a bedroom with a queen sized bed, a couch and as jacuzzi tub (tempting.....). She had me lay down, ran the ultrasound over my belly and determined quickly that the 'second baby' I was sure I felt was in fact my also beloved placenta laying on top of my single, healthy babe. It was one of those moments where you are happy and sad at the same time. Twins would be hard. But twins would be awesome! LOL! The midwife refused payment. I cried explaining to her how much she blessed me, especially after my previous experiences. I pray that God continues to bless her, as I could see He was certainly with her now. Towards the end of my second trimester, I got ill. I started feeling like I had a bladder infection. Unable to buy cranberry juice immediately I looked for other remedies. I read that blueberries would work just as well as cranberries. I had plenty of blueberries and blended them with water a few times a day. I felt a little better and was hopeful that it was working. But then I suddenly developed a high fever and sever lower back pain. I had also read that if not treated a bladder infection will go to your kidneys and a pregnant woman's body will usually expel the child. I was terrified. I sobbed bitterly. I was afraid of losing my child. And I was afraid of going to the hospital. I prayed for direction. And the Lord brought to mind our local midwife. Oh if she could help! I called her, still sobbing, and tripping over my words in my frantic state. She laughed. She calmly, happily advised me to take 1000mg of vitamin c three times a day with a LOT of water, and to call her if it did not quickly, dramatically improve. I was calmed by her calm. I quickly took my vitamin c and water and fell deeply asleep. I awoke two hours later with no fever, minor muscle soreness and an urgent need to visit the bathroom. :). After a week I was fully recuperated. My due date came and went. This came as no surprise. My first babe came seven days after and my third nine days after. My second only came on her due date because I took castor oil. I stopped taking and making phone calls and ignored numerous emails at this point. I was tired of the conversation. Friend or family member: Did you have the baby? Friend or family member: What?! Why not? Its so late? What's wrong? When are you going to the doctor? What if its too big to come out? What if you have some '_________' condition? Me: No, no. I'm fine really. It will be any time now. I had braxton hicks, contractions that don't start actual labor everyday, all day. I took numerous baths, stayed up late watching Heroes or reading Surviving Off Off Grid, thinking it was 'time'. weeks was kind of a cut off point. If your dates are right, which I was sure mine were, that baby simply must come out. So she checked my cervix and immediately laughed. "Oh girl! You are having this baby, tonight probably!" me entertained and did squats in the hopes that something, sometime soon might happen. I felt.... Not much different. Slowly over the next few hours the light braxton hicks contractions started up again. I was still pretty skeptical. If this was my labor, I could count myself highly blessed among women. It wasn't really painful at all. quicken labor. I got in, and it became clear that this was 'real' labor. I began to cry. It really hurt! My previous thoughts of 'oooh this is easy' were gone. again. I can't, I can't." I pushed and screamed. Oh God it hurt sooooooo much. happily come out of bed to enjoy their birth morning treat, pop tarts! Then... I feel it engaged! Yay! This is it! The pain is lessened, replaced with pressure, solid pressure. It was described to me as a hot bowling ball, and that is a really good description of it. I push and my water breaks, everywhere! Yes, until then it did not break. I apologize to my husband at this point because I am pretty sure he got doused. I push and a head is out! I push and shoulders are coming! I push and the baby is here!!!!!!! It was 7:58. I pick up my babe, seeing that it is a perfect tiny (to me) baby boy. I hold him to my chest and lay down, on my own bed. My husband covers us and invites the children to meet their new brother. I laugh. Yes, at this point I was laughing. My labor was so hilarious to me. I laugh that I was so afraid and in pain that I actually asked my husband for no more beautiful, sweet, joyous blessings like this babe! How ridiculous! "Aaron, it was so quick! Did you see how quick!" Fortunately my husband knows my heart. I would never be able to say no. I love them so. They bring so much joy to our lives, they bring so much clarity of purpose, sense of belonging, courage to do what is right, and delight in all things new. Since then I have already dreamt twice about my next babe..... Yes, my next. Not because this awesome child is not enough. But because my love for him whets the appetite. Praise Yah! Thank You for my beautiful, healthy, loving, smart children! May they follow hard after You all the days of their lives! La Soñador ~: Prepping for a Homebirth - I keep a 'Birth Tote' stocked and supplied at my home now. This is for any future births I may have or in the off chance that someone around my home goes into labor and is willing to accept my supplies and/or assistance. I have been quiet lately, on Facebook and here. Mostly I have been busy with my new baby, keeping my house, getting back on top of schooling. Some of my silence is due to my pondering. The election was just a few weeks ago. Before the votes were counted up, anxiety was high among many. Who would win? Who would lose? What did the future hold for us? Our families? Our country? My husband and I had thoroughly discussed our options, and the possible outcomes. We had chosen the path we felt was right according to our understanding of the word, in light of world events and historical context. We attacked the different angles, and when opposing viewpoints came to our attention, we accessed again and again if our perspective held its own. As always, I believe the truth can stand up under any and all scrutiny. The Lord does not turn away from a sincere seeker of truth. So when election day came, we knew that we would not be voting. When the news reported that Obama won a second term as president, we were not shaken. But my friends and family... were. Posts and conversations since have included their tears, fear, finger pointing, anger, and even threats and curses. I was left wondering, why are they so shaken? Psalm 56:11 says, "In God I have put my trust; I will not be afraid. What can man do to me?" Isaiah 36:6 says, "Look! You are trusting in the staff of this broken reed, Egypt, on which if a man leans, it will go into his hand and pierce it. So is Pharaoh king of Egypt to all who trust in him." Psalm 146:3 says"Do not put your trust in princes, Nor in a son of man, in whom there is no help." My perspective of the world....played out. The rigged system did exactly what was expected of it. And for the first time, I didn't play along. And I wasn't alone either. 50ish million voted for Romney. 60ish million voted for Obama. I built my perspective on the word, and on history... And the ground beneath my feet was not shaken, my foundations not shattered. If yours was.... Maybe you need to reconsider where you are building your hope and future. Psalm 118:8-9 says, "It is better to trust in the Lord than to put confidence in man. It is better to trust in the Lord than to put confidence in princes." Because the political structures of this world are not solid ground, but crumbling and rotten, the playground of the enemy. Luke 6:47-49 says, "Whoever comes to Me, and hears My sayings and does them, I will show you whom he is like: He is like a man building a house, who dug deep and laid the foundation on the rock. And when the flood arose, the stream beat vehemently against that house, and could not shake it, for it was founded on the rock. But he who heard and did nothing is like a man who built a house on the earth without a foundation, against which the stream beat vehemently; and immediately it fell. And the ruin of that house was great." Make a joyful noise unto YHVH, all ye lands. Serve YHVH with gladness: come before his presence with singing. Know ye that YHVH he is ELOHIYM: it is he that hath made us, and not we ourselves; we are his people, and the sheep of his pasture. 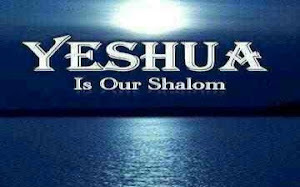 For YHVH is good; his mercy is everlasting; and his truth endureth to all generations.